Who doesn’t struggle with cards for men? I made this fairly quick one which would work for lots of occasions – it says Get in Gear on the front and you could easily add more info n the inside, like ...because it’s your birthday! or …because it’s Father’s Day or even …because it’s Valentines day! 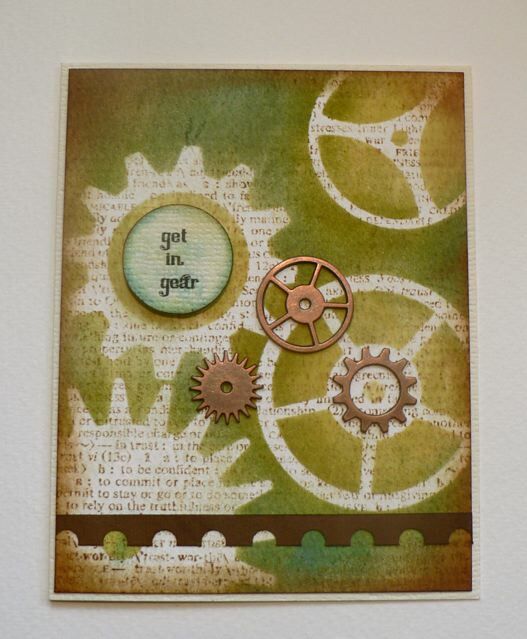 Pretty basic: stamp the wordy background, lay on the gear masks and smudge whatever colours you like around them (I used Peeled Paint, Shabby Shutters and Broken China) then do the edges (Vintage Photo) and add the gears. I printed the sentiment on cardstock as it was WAY too fiddly to try to stamp the letters in a row. The temptation would be to add a bit of ribbon, but that didn’t seem very “manly” to me. 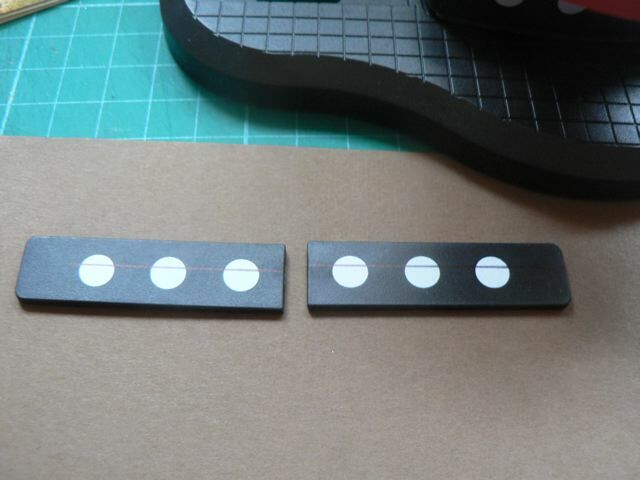 The die-cut cardstock that seems very popular nowadays is the punched circles – not really scalloped, per se, but decorative nonetheless. I thought a strip of that would be a perfect stand in for girly ribbon so I punched my own. I have (just got) one of the 7 Gypsies border punch sets that has a row of circles. 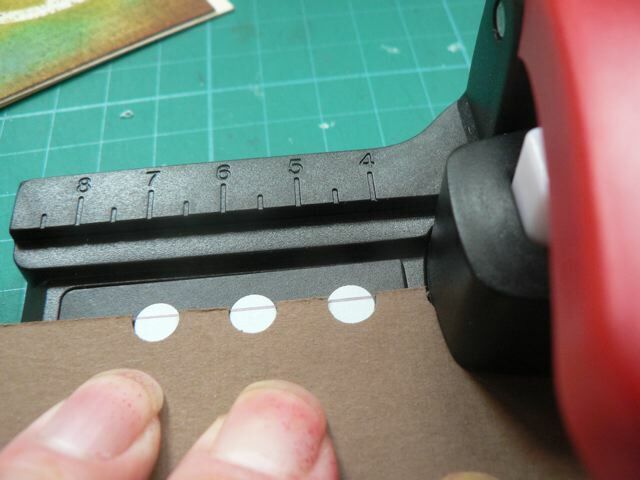 I think I was thinking that this would be better if I wanted something that was close to 12 x 12, if for example I just wanted the edge for a full sheet of cardstock, rather than losing a 1/2 inch or so by punching normally and cutting off 1/2 way through the circles for a small piece but I didn’t think of that till I had already done it this way. Doh! Still it will be handy for layouts. I need to test out the corner-turning to see how easy that is to do, in case I want a square with uniform holes all around the edges! I keep thinking I’ll do a layout but stuff keeps getting in the way. Maybe tomorrow. Categories: cards, tips & finds | Tags: cards, stamps | Permalink. I have a terrible time making masculine cards. Yours is great!